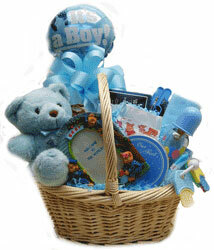 This gift basket makes a great gift for the new parents and the baby boy or girl (choose when ordering)! Filled with a Bottle, Diapers, Photo Frame, Plush Toy, Receiving Blanket, Teething Ring, Wipes, Washcloths, Gourmet Cookies, and fancy Popcorn & Pretzels for the parents! Order either a baby boy gift basket or baby girl basket. Wrapped in Crisp Clear Cellophane and topped off with a Baby Themed Print Cellophane Fan underneath a Handmade Bow. Includes a Handwritten Enclosure Card. Add balloons for only $2 each. NOTE: Choose boy (blue-shown) or girl (pink). We are out of the basket for this particular design, but can substitute another basket.